Pensioner’s Portal has provided the Revised Pension Calculator for Pre- 2016 Pensioners and Family Pensioners. Now, Pensioners and Family Pensioners may get their Pension with Arrears under 7th Central Pay Commission. 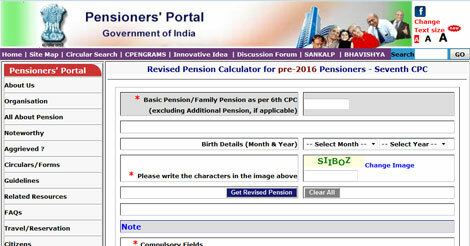 The Revised Pension/Family Pension Calculator for Pre-2016 Pensioners updated Under Pensioner’s Portal, Government of India. The Easy way to find and get their Pension under Seventh Pay Commission.